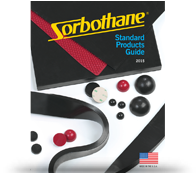 Sorbothane® dramatically reduces vibration and absorbs shock to help ensure the safe and effective delivery of precious cargo anywhere in the world. Our padding and supports are trusted to safeguard the delivery and storage of ancient antiquities. Sensitive medical equipment is transported in protective containers that utilize the shock and vibration damping of Sorbothane® materials. A Sorbothane® support system successfully moved and protected an American treasure – the Liberty Bell – from hazardous vibration. See samples of solutions we’ve provided to the Transportation Shipping & Logistics industry.